● Harvick started 23rd and finished 16th. ● Climbed to 21st after 10 laps. ● Pitted for fuel only during a caution period on lap 16. Restarted in 16th on lap 18. ● “Loose” was how Harvick described his No. 4 Mobil 1/O’Reilly Auto Parts Ford Mustang on lap 36. 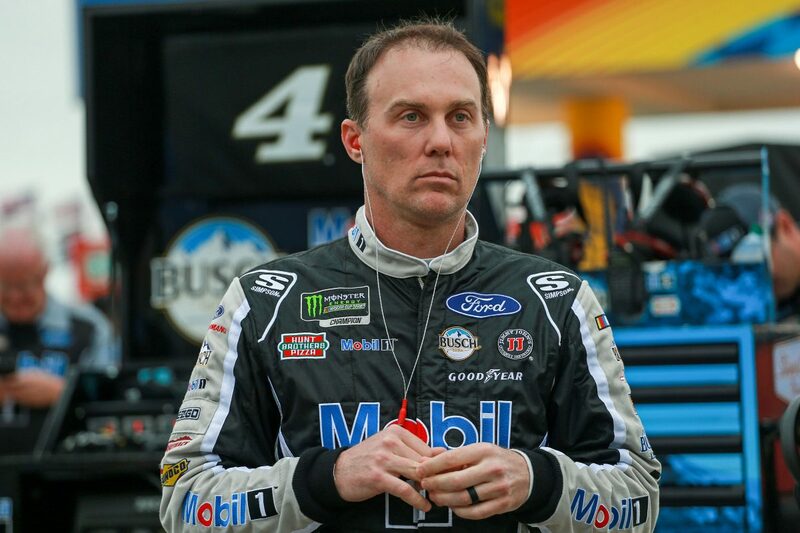 ● Harvick radioed on lap 48, “Don’t have enough rear grip,” as his Stewart-Haas Racing teammate Clint Bowyer passed him for 14th. ● Pitted for four tires and fuel on lap 79. Made a slight air pressure adjustment to front tires and added tape to grill opening. ● “Splitter is hitting the ground. Vibrates terrible,” said Harvick on lap 83 shortly after the pit stop. ● Stayed out at the end of the stage and gained valuable track position. Was one of only six drivers not to pit. ● Harvick started fourth and finished 16th. ● Jumped up to second place following lap-92 restart. Dropped to sixth by lap 98, but got back to fifth by lap 100 before settling back into sixth a few laps later. ● Made a scheduled, green-flag pit stop on lap 144 for four tires and fuel. Only adjustment was to tire pressures. ● Caution on lap 150 caught Harvick a lap down. He took wave-around to get back on lead lap. Restarted 14th on lap 158. ● Pitted for four tires and fuel at the end of the stage, with adjustments to left-rear and right-rear wedge. ● Started 18th and finished eighth. ● Uncontrolled tire from pit stop at end of Stage 2 sent Harvick to the tail end of the longest line for lap-177 restart. ● Climbed to 14th by lap 200. ● Rose to seventh by lap 230 as green-flag pit stops cycled through. ● Made a scheduled, green-flag pit stop on lap 238 for four tires and fuel with a right-rear wedge adjustment. ● Returned to 14th position by lap 250 after pit-stop cycle had been completed. ● “Too loose. All over the place,” said Harvick on lap 254 while running 14th. ● Took advantage of caution on lap 257 and pitted for four tires and fuel. Restarted 13th on lap 260, but dropped to 15th shortly thereafter. ● Cracked the top-10 on lap 282. ● Last round of green-flag pit stops began on lap 300, allowing Harvick to climb up the leaderboard. ● Pitted under green for fuel only on lap 319. Returned to the track in eighth, and held position through the finish. ● Harvick earned his sixth top-10 of the season and his 21st top-10 in 33 career Monster Energy NASCAR Cup Series starts at Texas. ● This was Harvick’s 10th straight top-10 at Texas and his 13th top-10 in his last 15 start at Texas. ● Denny Hamlin won the O’Reilly Auto Parts 500 to score his 33rd career Monster Energy NASCAR Cup Series victory, his second of the season and his third at Texas. His margin of victory over second-place Bowyer was 2.743 seconds. ● There were five caution periods for a total of 29 laps. ● Only 15 of the 39 drivers in the O’Reilly Auto Parts 500 finished on the lead lap. ● Kyle Busch leaves Texas as the championship leader with an eight-point advantage over second-place Hamlin. The next event on the Monster Energy NASCAR Cup Series schedule is the Food City 500 on Sunday, April 7 at Bristol (Tenn.) Motor Speedway. The race starts at 2 p.m. EDT with live coverage provided by FS1.